Recommending a trimming schedule that fits all situations is tough. I realized I cannot give specific guidelines, because I trim some horses as often as every two weeks, and the occasional horse just one to three times a year. My website is based on trying to help you, the horse owner, trust yourself, so I will share some of the information I factor into my decisions. There is not one optimal trimming schedule for every horse and every situation. If the horse is sound, I usually start these horses on a normal four to six week trimming schedule. Even if the horse has distorted looking hooves, I don’t worry. If the horse is clearly doing well, I am not going to interfere. If the feet look oddly shaped or over-grown, I nudge them into a more normal shape. I always remind myself that trimming is a process. Comfort is more important than looks. Here is a pony that had really over grown hooves, but she was comfortable and happy. I did not aggressively trim her. She had a history of laminitis, but was doing well at this time. She was being ridden and her diet was monitored for sugars, so her insulin resistance was under control. I left her soles alone and reduced the wall length from the top. After three months of trimming every four weeks, her hooves are responding nicely. She has an old abscess growing down. That is what you see at the bottom of her foot. In another trim it will be gone. I will emphasize again, comfort is more important than looks. If the horse is unsound, I prefer to put them on a shorter trimming schedule. At least for the first few trims. 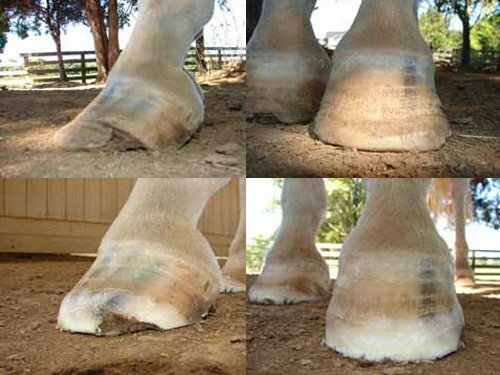 I try to figure out if it is a hoof problem or a health issue. If I trim frequently and make smaller changes, I am less likely to make the horse sore. 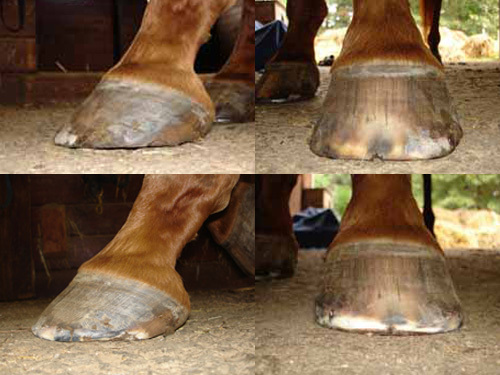 This way I can affect changes in the hoof and see if the horse responds by getting more comfortable. If the horse continues to be sore, I may be dealing with more than hoof problems. 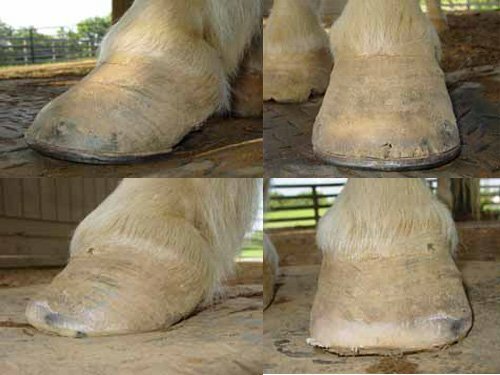 The closer the trims, the less hoof I am take off. All horses are different, so I experiment. Here is a very flat-footed, thin walled horse. When I met this mare, she was very foot sore. It was a challenge to help her get comfortable. I put her on a strict four week trimming schedule. I would have preferred seeing her every two weeks, but owner finances restricted this. This is eight months of trimming. 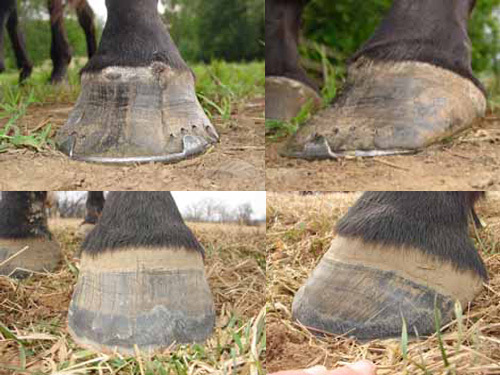 Horses that are really foot-sore do best with small, frequent trims. 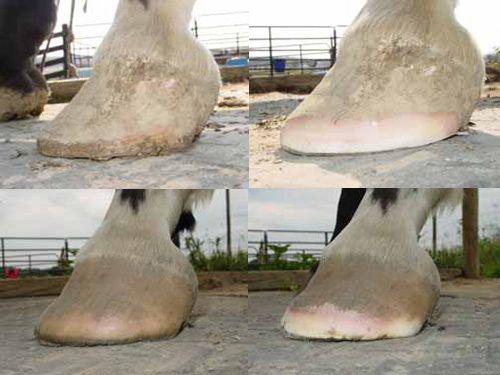 Unless the cause of laminitis is addressed, the horse will usually continue to be sore. It does help to reduce leverage from long hoof walls. This guy was really uncomfortable. The owners worked to fix his diet and environment and I trimmed him every three to four weeks. This gelding improved rapidly. I am sure it took addressing his health along with the feet. This is the first and third trim. The bottom pictures are six weeks from the top pictures. He is much happier after only six weeks. Over-trimmed hooves need to be left alone. If the foot looks too short because it has been worn away or trimmed away, then leave them alone for four, six or eight weeks. I lightly rolled the edges of this foot and left him alone. I checked again two weeks later but only smoothed the outside edge again. After the initial two week check, I waited six weeks to trim him. He still had very little foot. As a professional trimmer, I am restricted by circumstances. Sometimes the trimming schedule I follow for my client’s horses is not ideal. I do the best that I can with the options I am given. There are times that I have to trim more than I am comfortable, because I cannot see the horse at optimal intervals. I do what I call an owner trim on my riding mare. I lightly touch up her feet every two or three weeks. She likes having longer walls and a smaller mustang roll. If it is going to be six weeks between trims, I have to give her my professional trim and take more off at one time. Your personality type will also determine the ideal trimming schedule. Bold trimmers will more likely over trim the horse. If that is your normal inclination, it may be best to wait between trims. Timid trimmers may need to shorten the trim cycle. The better you know yourself, the better you can decide. Health, environment and diet play a significant role in deciding how frequently to trim. If you are trimming your own horse, don’t get too rigid in your schedule. Trust your horse to guide you.